Visit Arlington National Cemetery and explore some of the most-famous monuments and memorials around Washington, DC on this guided, half-day sightseeing tour. 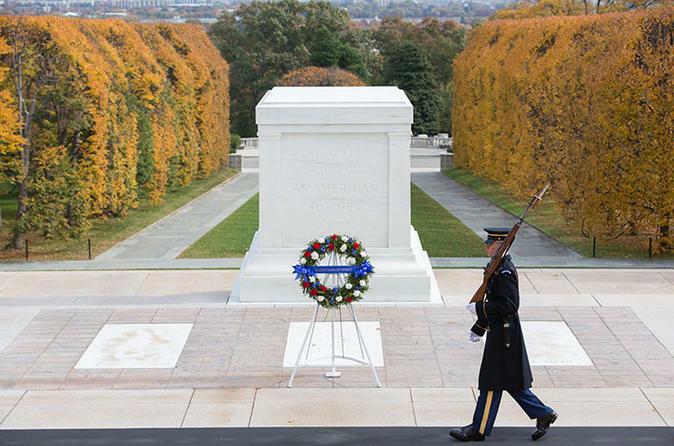 Witness the 'Changing of the Guard' at the Tomb of the Unknowns, and visit John F. Kennedy's grave site. Take a guided bus tour of the National Mall and stop at famous locations like the Korean War Veterans Memorial, Vietnam Veterans Memorial, and more. Also, see the Lincoln Memorial, the Martin Luther King, Jr. Memorial, and many more. This tour will involve quite a bit of walking for about 2 hours and will require that people be physically fit and wear comfortable shoes. Not well suited for disabled people or people in wheelchair. It's not recommended to carry babies on this tour. Check out the highlights of the nation's capital on this 5-hour tour that includes Arlington National Cemetery, the top sites on the National Mall, and the National Museum of Natural History — with plenty of time to take in the many nearby museums or archives afterwards. Enjoy the best of both worlds. A friendly tour guide will lead the way through Washington, DC and Arlington, Virginia — with expert commentary and personalized care, covering over 200 years of history. Take a 2-hour stroll through Arlington National Cemetery with an expert guide and visit John F. Kennedy's grave site. See the John F. Kennedy Eternal Flame, which was lit by Jackie Kennedy over 50 years ago. Then continue along to the Tomb of the Unknown Soldier and witness the 'Changing of the Guard,' a long-running ceremony considered by many to be one of the can't miss events when visiting DC. Also, enjoy a guided tour of many of the top sites in the nation's capital, including the White House and Lincoln Memorial. An air-conditioned motor coach will travel from one site to the next. Survey the entire National Mall from the bus, learn about Washington and its history, then step out at select locations for a guided walk through the memorials. At the end of the tour, the bus will provide a convenient drop-off at the National Museum of Natural History. Take in the museum, the National Gallery of Art, the National Air and Space Museum, National Archives Building, or the National Museum of American History — all located just a couple blocks away — if desired.